Have you heard of the 5:2 diet so popular in England? If you’re interested in learning more about an intermittent fast weight loss plan, start here first. From prepping your food to finding a diet buddy, these fast-friendly tips from the diet’s creator will help you find the weight loss you desire. From The FastDiet by Dr. Michael Mosley and Mimi Spencer. 1. Know your weight and your BMI from the get-go. As we mentioned earlier, one of the best things you can do is calculate your body mass index—your weight (in pounds) divided by your height (in inches) squared, multiplied by a conversion factor of 703; it may sound like palaver, and an abstract one at that, but it’s the best tool we have to plot a path to healthy weight loss. (Or you can just let a BMI website do the calculation.) Do note that a BMI score takes no account of body type, age, or ethnicity, and so should be greeted with informed caution. Still, if you need a number, this is the one to watch. Weigh yourself regularly but not obsessively. Once a week should suffice. The mornings after fast days are best if you like to see falling figures. Researchers at the University of Illinois have noted that “weight measurements are drastically different from feed to fast day. This discrepancy in body weight is most likely due to the additional weight of food present in the gastrointestinal tract, and not changes in fat mass from day to day. As a potential solution, future trials should average body weight measurements taken from consecutive feed and fast days to attain a more accurate assessment of weight.” You might like to do the same, but don’t make weighing—yourself or your food—a chore. If you are someone who enjoys structure and clarity, you may want to monitor your progress. Have a target in mind. Where do you want to be, and when? Be realistic: precipitous weight loss is not advised, so allow yourself time. Make a plan. Write it down. Plenty of people recommend keeping a diet diary. Alongside the numbers, add your experiences; try to note down “Three Good Things” that happen on that day. It’s a feel-good message that you can refer to as time goes by. 2. Find a fast friend. You need very few accoutrements to make this a success, but a supportive friend may well be one of them. 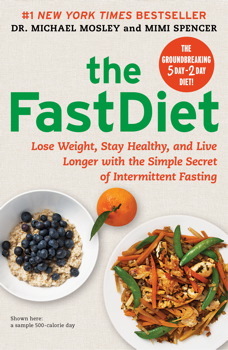 Once you’re on the FastDiet, tell people about it; you may find that they join in, and you’ll develop a network of common experience. Since the plan appeals to men and women equally, couples report that they find it more manageable to do it together. That way you get mutual support, camaraderie, joint commitment, and shared anecdotes; besides, mealtimes are made infinitely easier if you’re eating with someone who understands the rudiments of the plot. There are plenty of threads on online chat rooms and forums, which are great sources of support and information. It’s remarkable how reassuring it is to know that you’re not alone. 3. Prep your fast-day food in advance so that you don’t go foraging and come across a leftover sausage lurking irresistibly in the fridge. Keep it simple, aiming for fast-day flavor without effort. Shop and cook on nonfast days instead, so as not to taunt yourself with undue temptation. Before you embark on the FastDiet, clear the house of junk food. It will only croon and coo at you from the cupboard, making your fast day harder than it needs to be. 4. Check calorie labels for portion size. When the cereal box says “a 30g serving,” weigh it out. Go on. Be amazed. Then be honest. Since your calorie count on a fast day is necessarily fixed and limited, it’s important not to be blinkered about how much is actually going in. Or download a calorie counter app such as www.myfitnesspal.com. For more detailed information, try www.nutritiondata.self.com, which includes specific search criteria to allow you to fit your food choices not only to your calorie allocation but also to your nutritional needs. Way more important: don’t count calories on a nonfast day. You’ve got better things to do. 5. Wait before you eat. Try to resist for at least ten minutes, fifteen if you can, to see if the hunger subsides (as it naturally tends to do). If you absolutely must snack, choose something that will not elevate your insulin levels. Try some carrot sticks, a handful of plain air-popped popcorn, an apple slice, or some strawberries. But don’t pick and peck like a hen through the day; the calories will soon stack up and your fast will be dashed. On fast days, eat with awareness, allowing yourself to fully absorb the fact that you’re eating (not as daft as it sounds, particularly if you have ever sat in a traffic jam popping M&M’s). Similarly, on off-duty days, stay gently alert. Eat until you’re satisfied, not until you’re full (this will come naturally after a few weeks’ practice). Work out what the concept of “fullness” means for you—we are all different, and it changes over time. 6. Stay busy. “We humans are always looking for things to do between meals,” said singer-songwriter Leonard Cohen. Yes, and look where it’s got us. So fill your day, not your face. As fasting advocate Brad Pilon has noted, “No one’s hungry in the first few seconds of a skydive.” Engage in things other than food—not necessarily skydiving, but anything that appeals to you. Distraction is your best defense against the dark arts of the food industry, which has stationed doughnuts on every street corner and nachos at every turn. And remember, if you must have that doughnut, it will still be there tomorrow. 7. Try the two-to-two, fasting not from bedtime to bedtime, but from 2:00 p.m. until 2:00 p.m. After lunch on day one, eat sparingly until a late lunch the following day. That way, you lose weight as you sleep and no single day feels uncomfortably deprived of food. It’s a clever trick, but it does require a modicum more concentration than the whole-day option. Or perhaps fast from supper to supper, which again means that no day is “all fast and no fun.” The point is that this plan is “adjust to fit.” Just like your waistband in three weeks’ time. 8. Don’t be afraid to think about food you like. A psychological mechanism called habituation—in which the more people have of something, the less value they attach to it—means that doing the opposite and trying to suppress thoughts of food is a flawed strategy. The critical thought process here is to treat food as a friend, not a foe. Food is not magical, supernatural, or dangerous. Don’t demonize it; normalize it. It’s only food. 9. Stay hydrated. Find no‑calorie drinks you like, and then drink them in quantity. Some swear by herbal tea, others prefer mineral water with bubbles to dance on the tongue, though tap water will do just as well. Plenty of our hydration comes through the food we eat, so fasters may need to compensate with additional drinks beyond their routine intake (check your urine; it should be plentiful and pale). While there’s no scientific rationale for drinking the recommended eight glasses of water a day, there is good reason to keep the liquids coming in. A dry mouth is the last sign of dehydration, not the first, so act before your body complains, recognizing too that a glass of water is a quick way to hush an empty belly, at least temporarily. It will also stop you from mistaking thirst for hunger. 10. Don’t count on weight loss on any given day. If you have a week when the scale doesn’t seem to shift, dwell instead upon the health benefits you will certainly be accruing even if you haven’t seen your numbers drop. Remember why you’re doing this: not just the smaller jeans, but the long-term advantages: the widely accepted disease-busting, brain-boosting, life-lengthening benefits of intermittent fasting. Think of it as a pension plan for your body. 11. Be sensible, exercise caution, and if it feels wrong, stop. It’s vital that this strategy should be practiced in a way that’s flexible and forgiving. It’s okay to break the rules if you need to. It’s not a race to the finish, so be kind and make it fun. Who wants to live longer if it’s in abject misery? You don’t want to grunt and sweat under a weary life. You want to go dancing. Right? 12. Congratulate yourself. Every completed fast day means potential weight loss and quantifiable health gain. You’re already winning.